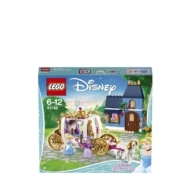 - Includes 2 mini-doll figures from Disney’s Cinderella: Cinderella with switchable skirts and the Fairy Godmother, plus 2 animal figures: a horse and a mouse. 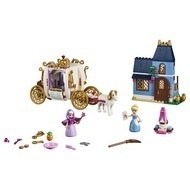 - Features Cinderella’s Carriage, Cinderella’s house with 2 stories, and a revolving stand for her ball gown. - Cinderella's Carriage sits 2 mini-doll figures and features a removable roof for easy play inside, opening door and an opening chest. - Cinderella's house features an opening door and windows, downstairs kitchen area with sink and table, and a sleeping area upstairs. - Accessory elements include an invitation, 2 keys, magic wand, broom, hairbrush, scissors, plate with food and a piece of cheese. - Play and sing all day with Cinderella and her little mouse friend, as they do their chores around the house. - Help the Fairy Godmother transform Cinderella's rags to a ball gown and show her around her amazing horse-drawn carriage. - Play out your favorite scenes from the movie or create new stories of your own with these much-loved characters. - Cinderella’s carriage measures over 4” (11cm) high, 9” (24cm) long and 2” (7cm) wide. - Cinderella’s house measures over 5” (14 cm) high, 4” (11cm) wide and 1” (5cm) deep.